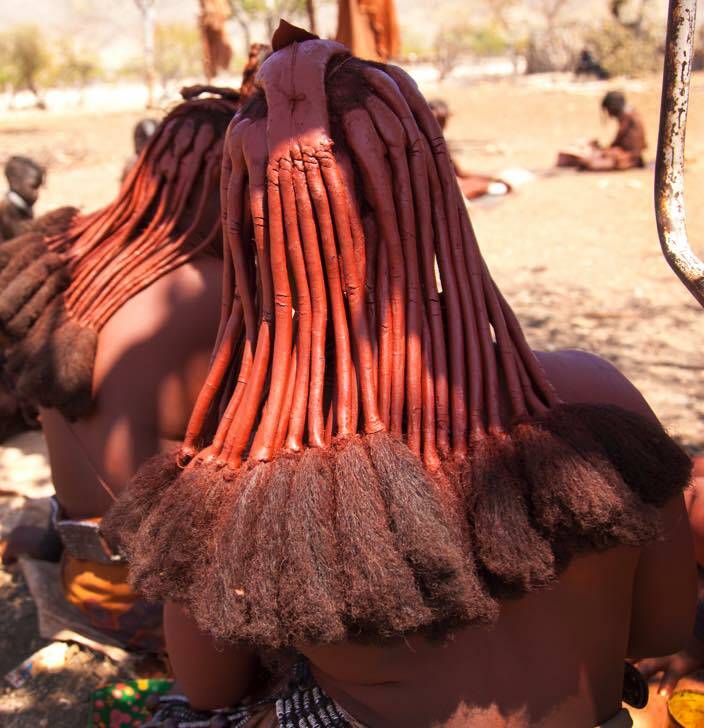 According to tradition, a young girl wears her two front plaits of hair forward so they grow over her face. 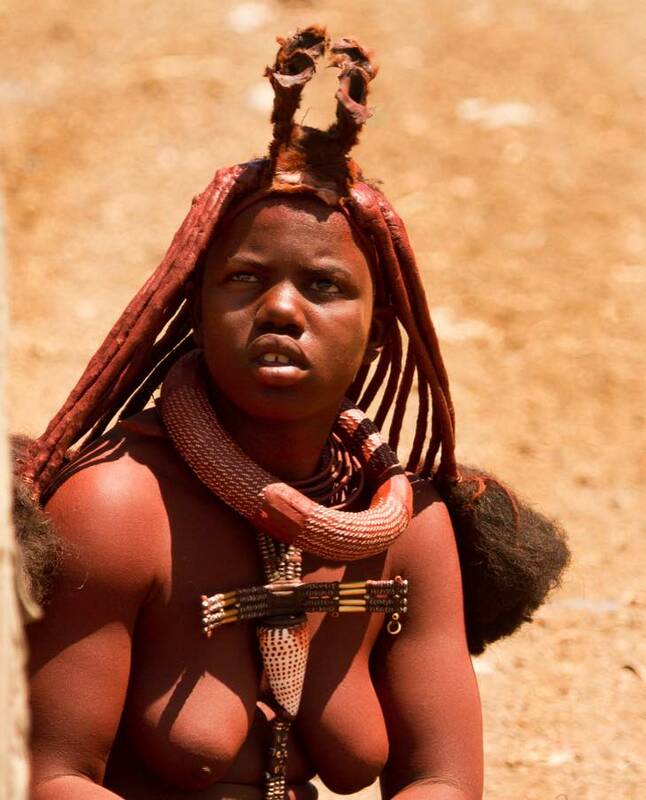 When she reaches puberty her hair will be swept back in multiple plaits adorned with otijze. 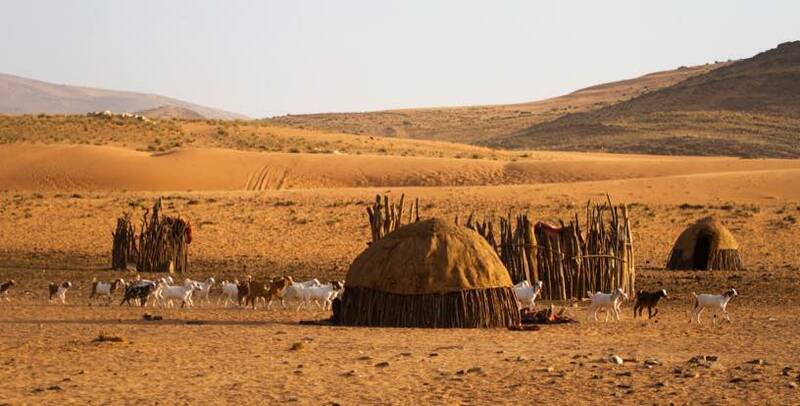 Goats play a critical role in the life of the Himba, providing meat and milk, as well as skins used for clothing and decoration, but the number of cattle is the way they count their wealth. 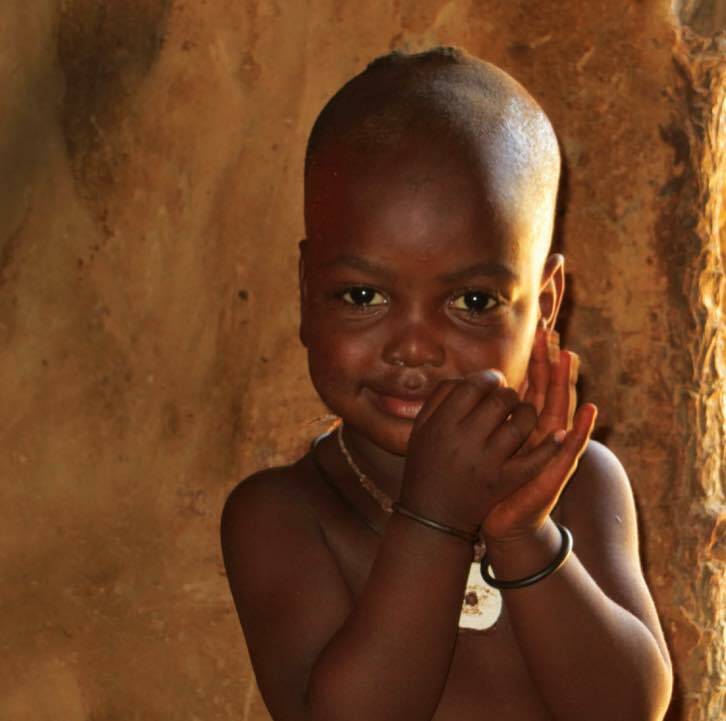 Access to water is a daily concern and it is reserved only for drinking. 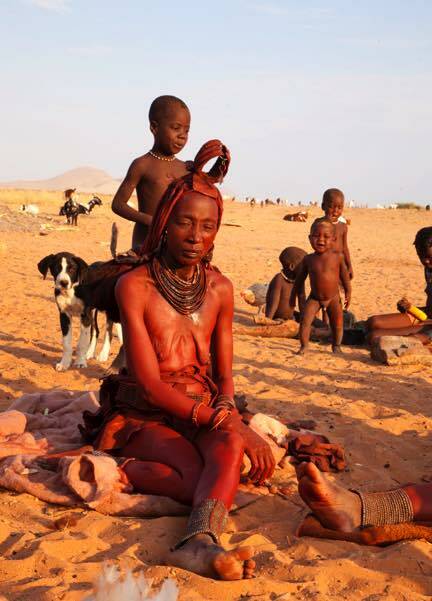 The Himba usually have to make long trips of several miles to the river for water. They put up their villages this far away from the river to protect livestock and children from crocdiles and other predators near the river. 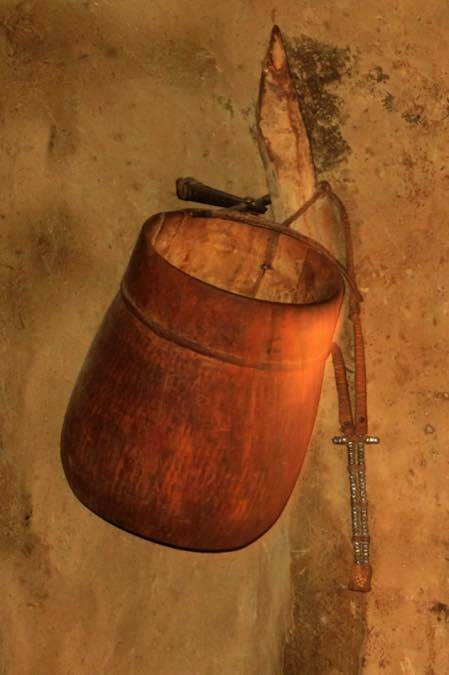 Men will sometimes carefully bath at the river when getting water. They throw rocks in the river to try and reveal where the crocs are. 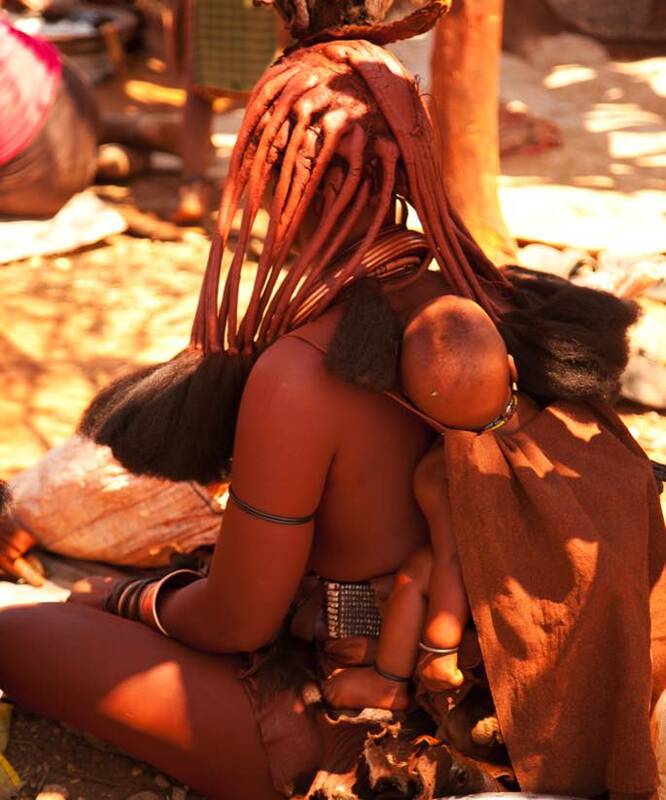 Himba women also wear a headdress if they're married, which usually takes the form of a small hat made of leather. 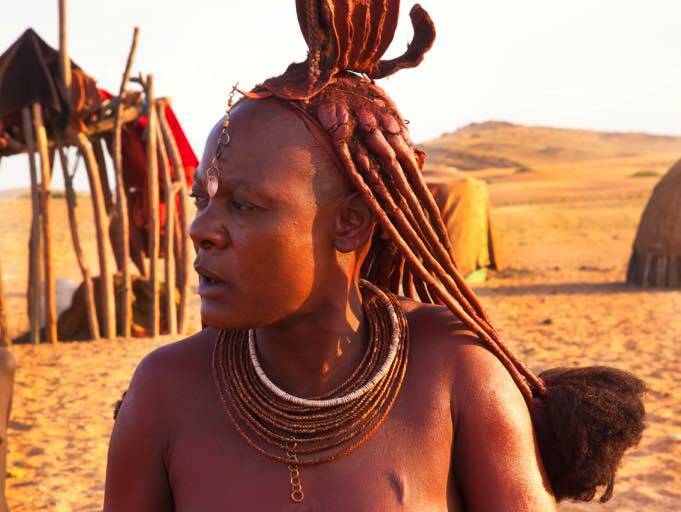 This is the head lady of her village. 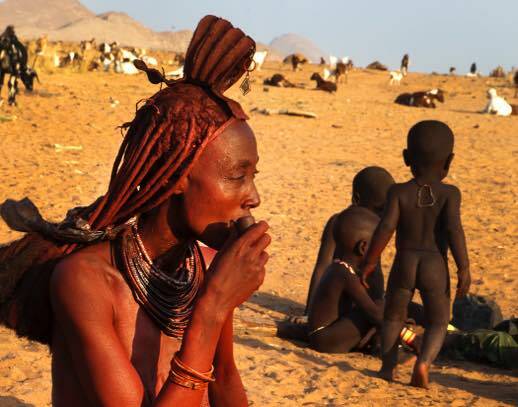 Himba women do take a daily smoke bath in order to maintain personal hygiene. They will put some smouldering charcoal into a little bowl of herbs and roots (mostly leaves and little branches of Commiphora trees) to perfume their bodies. They sit by the burning herbs under a blanket. 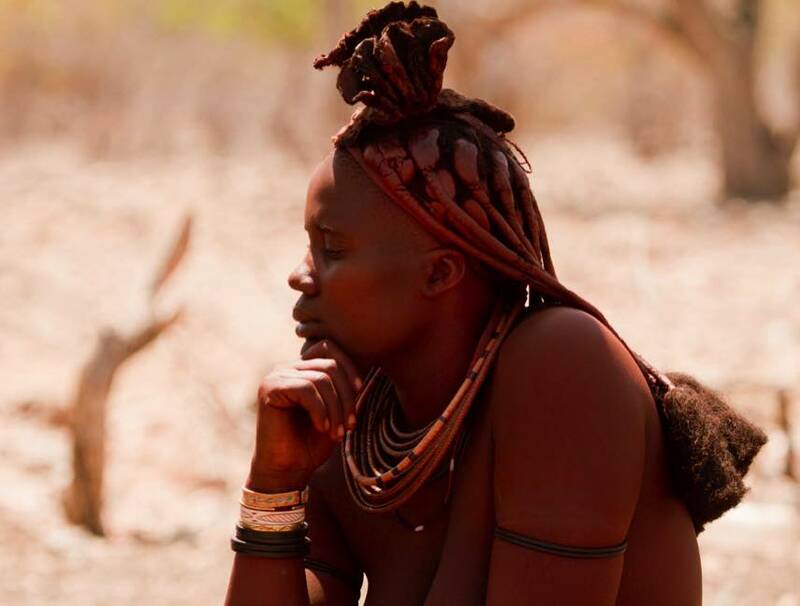 Just due to the vast isolated desert area the Himba live in, visits are limited.There has been very little westernisation within the tribes and they somewhat resist the tourist industry. 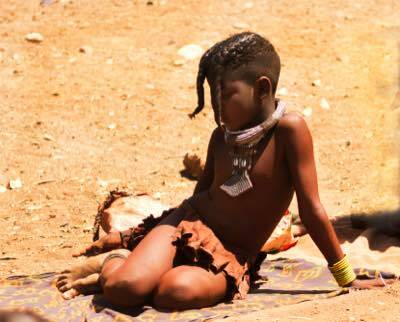 The government controls contact with the tribes as well. 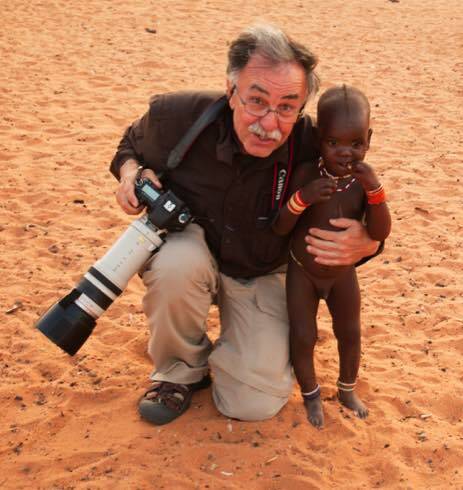 We accessed the tribal areas by plane and then jeep. We saw very few men in the villages we visited. 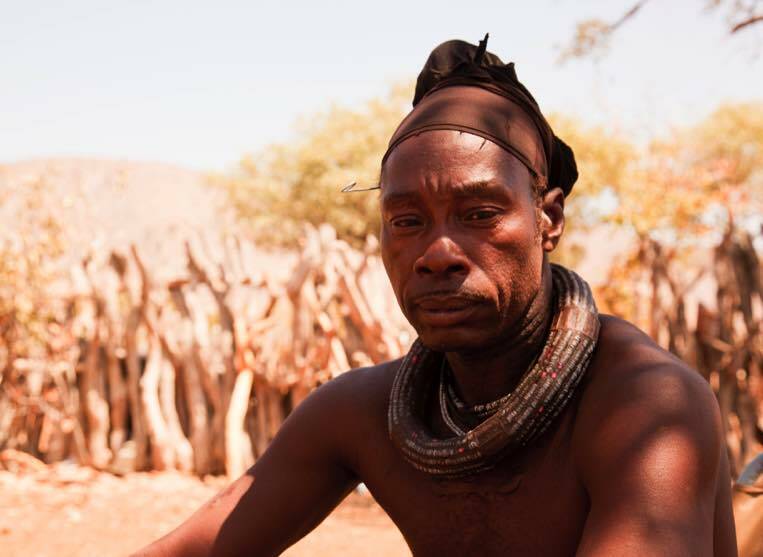 The men spend most of their time looking after the cattle and may be away from the village for several days, seeking grazing areas for the cattle. 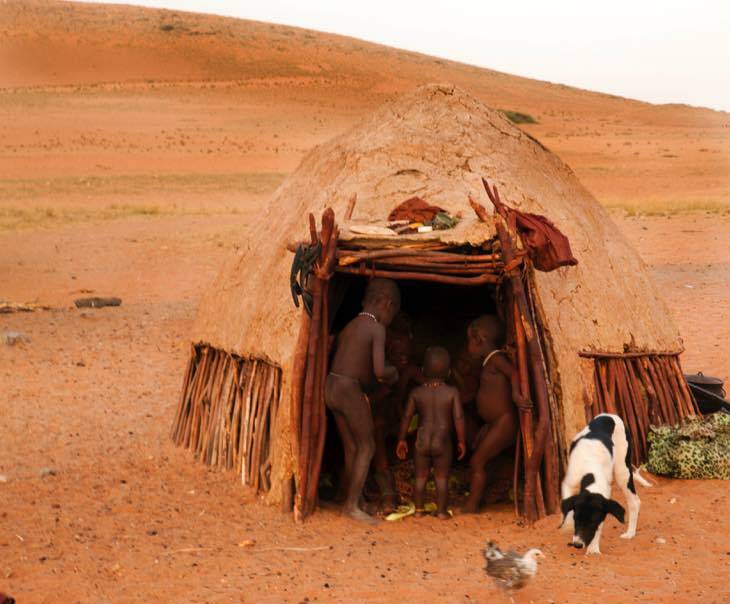 The daily life for the women of the village consist of looking after their children, preparing meals, milking the cattle at dawn each day, and collecting wood for fires and for building huts. Sometimes the work is very physical, such as when digging for water in the sands of a dry river bed. 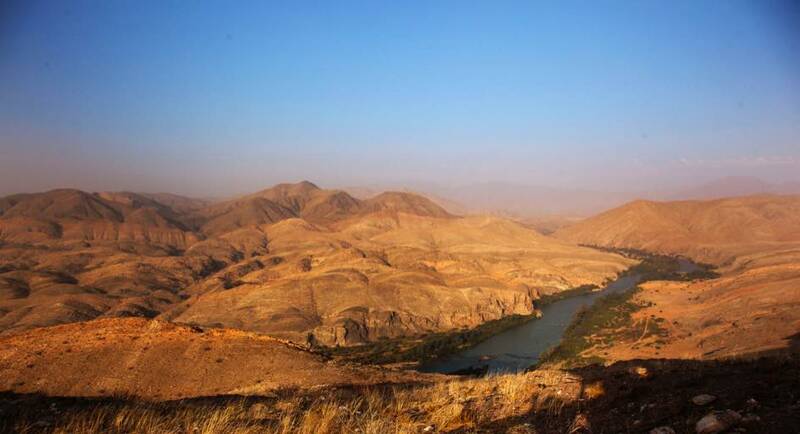 The Kunene River forms the border of northern Namibia and southern Angola. 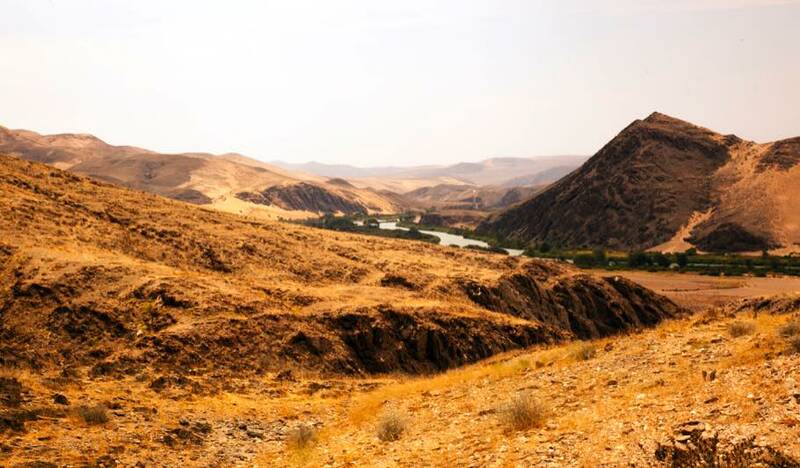 The shores of the river are a green oasis in the middle of desert. 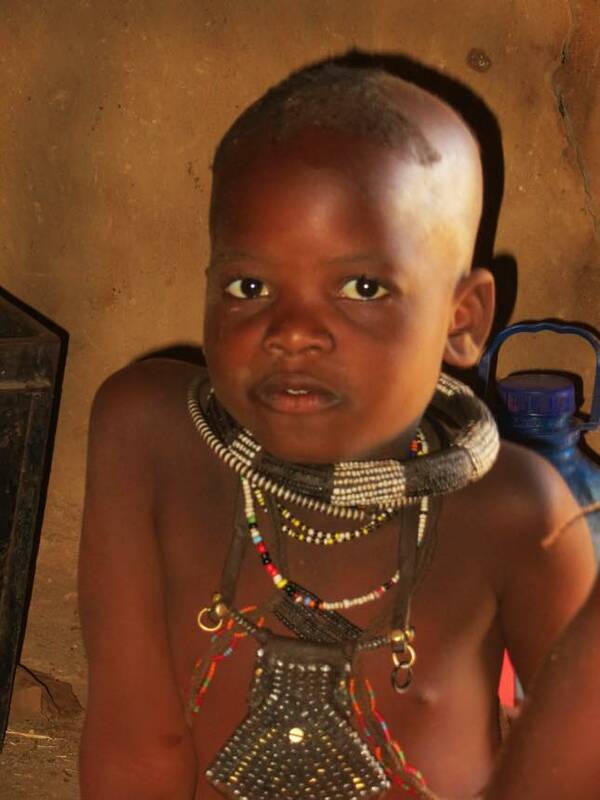 The ankle bracelets that the women wear are not only decorative, they also help prevent bites from toxic insects and snakes. There is a special ceremony when a girl experience menarche. To celebrate this rite of passage. She must leave the village for several days on her own, and on her return a goat is sacrificed for a feast and she is adorned with jewlery. 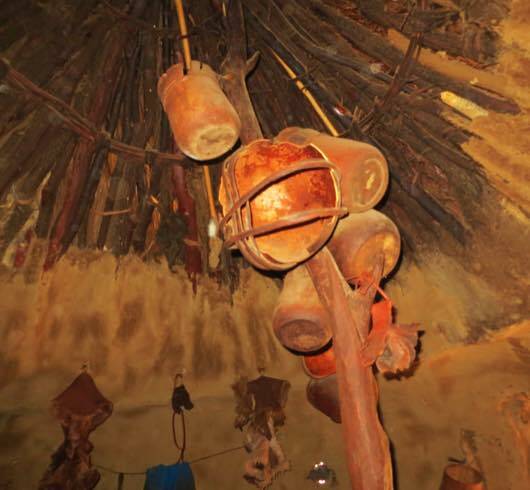 One of the most iconic of the necklaces they wear is called the Ohumba. It is made of metal beads that support a shell. This necklace is a symbol of fertility and is passed down from one generation to the next. 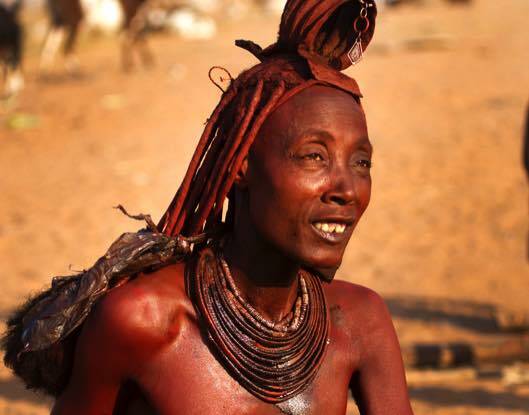 Men can marry several women, depending on their level of wealth, which is mainly judged by the the number of cattle they own. But women are permitted only one husband. Meat is only eaten on special occasions. The usual diet is a porridge every morning and evening. 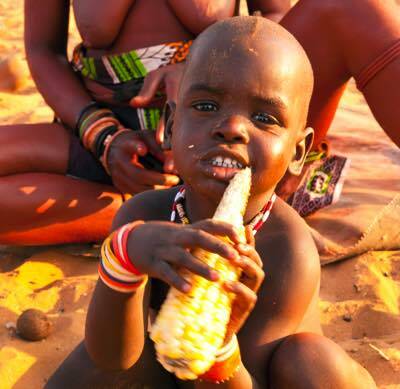 The porridge is made from the flour of maize. 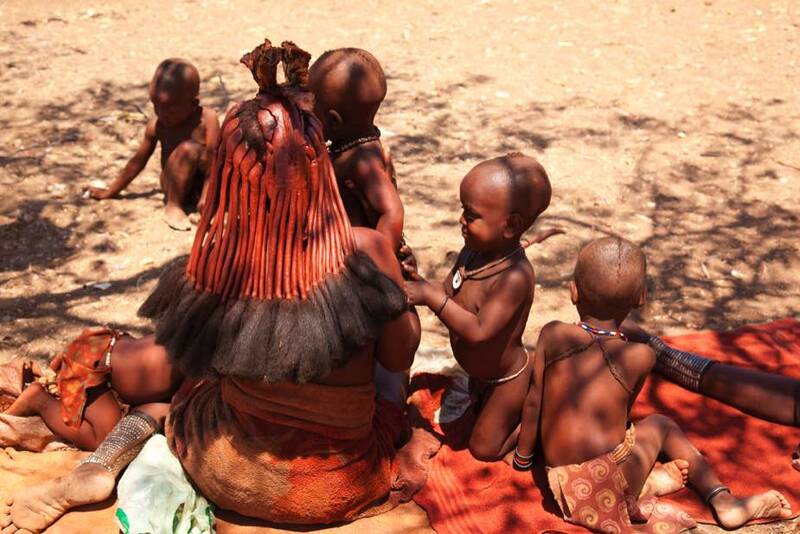 It was truly an honor to be able to visit the Himba villages. 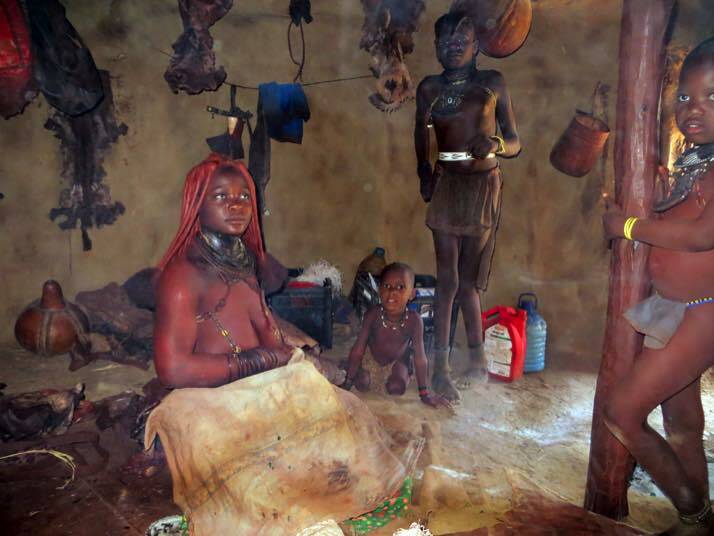 Unfortunately, visitors can't help but eventually upset the traditional lifestyle and culture of the Himba people. Our guide, Alpha, stopped at a grocery store and we bought staples to offer as a thank you for allowing our visit. The women of the village also make jewelry and crafts that they sell to visitors. The Head Man of his village. We were told he is in his early 50's, has four wives and nine children. He had been attacked by a crocodile when he was 15. 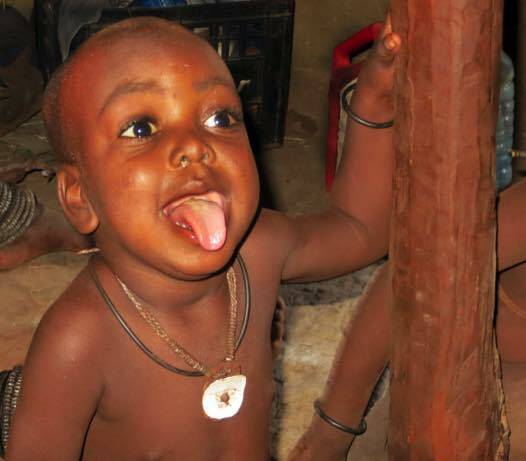 One thing is for sure, kids will be kids, no matter where they live. 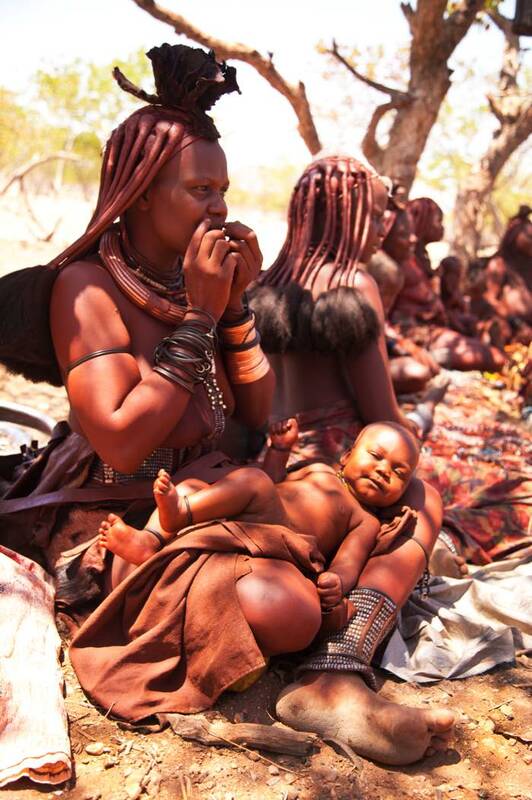 The Himba are a semi-nomadic tribe living in the Kunene River region of northern Nambia and southern Angola. 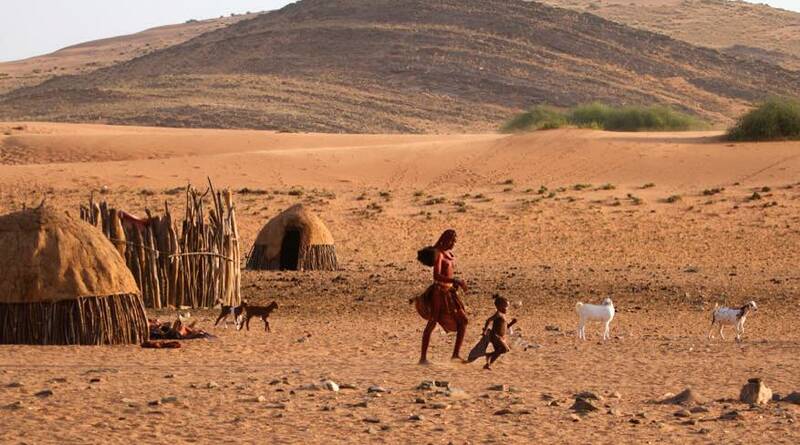 The tribe has lived in a vast remote isolated desert area and because of this seclusion they still hold their ancient culture and traditional lifestyle. 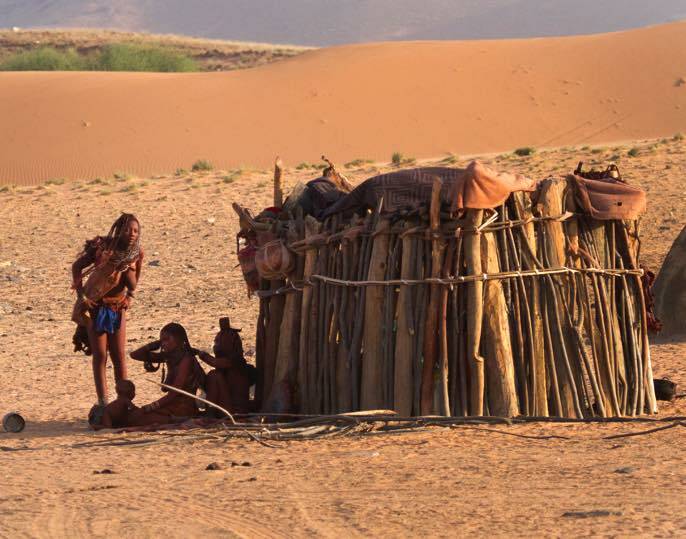 The total population of the tribe is perhaps 50,000, and many have only had contact with the outside world in the last 15 years or so. 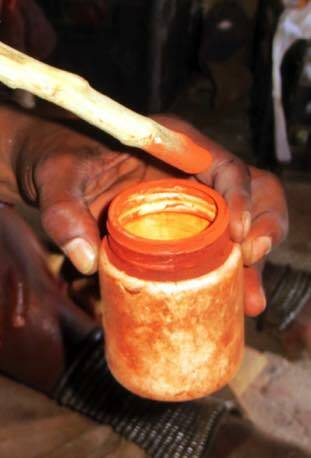 Otijize is made by pounding the ochre stone (Hematite) into small pieces. Thereafter the fragments are mixed with butter, slightly heated by means of smoke and applied on the skin. 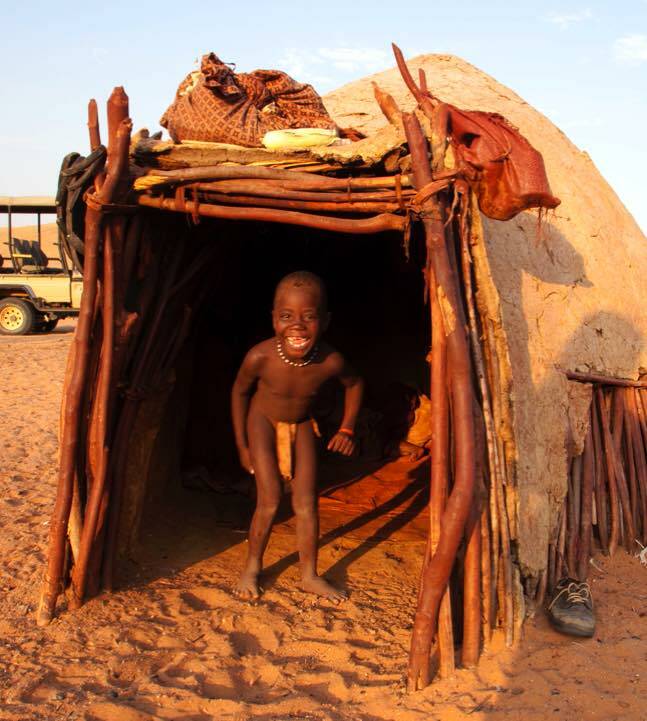 Himba communities are quite small. 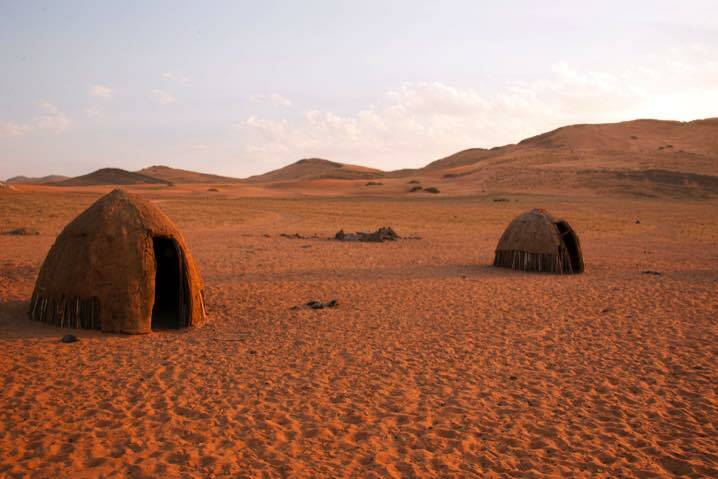 Villages are usually made up of relatives and usually have several to a dozen huts. 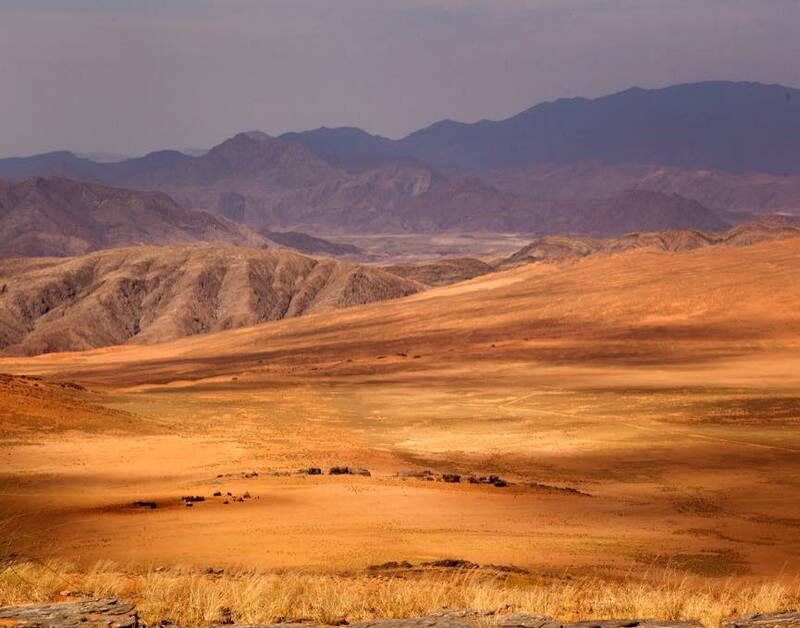 This is a shot of a Himba village from a distance. 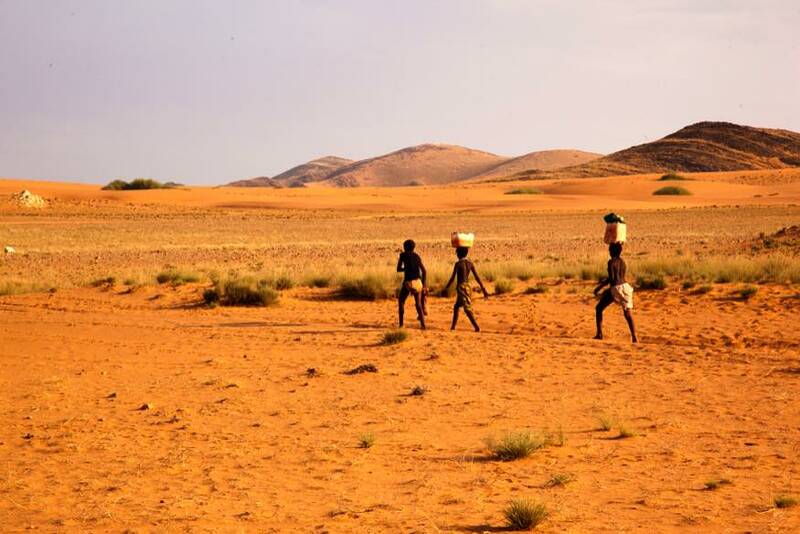 In this vast desert wilderness, they are nomadic pastoralists and migrate seasonally from a "home" village to areas with sufficient grass for grazing. 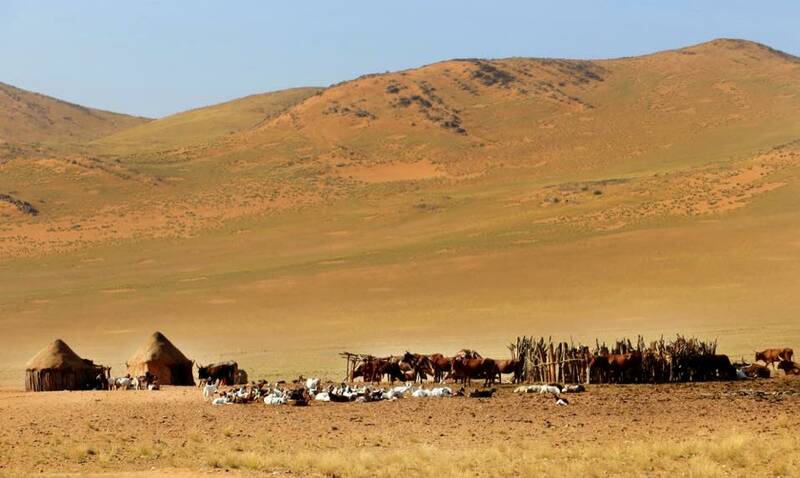 As they reach a different watering and grazing area, they build temporary huts, using a mixture of mud and cow dung plastered over a wooden frame. The huts are very small and are only used for sleeping. 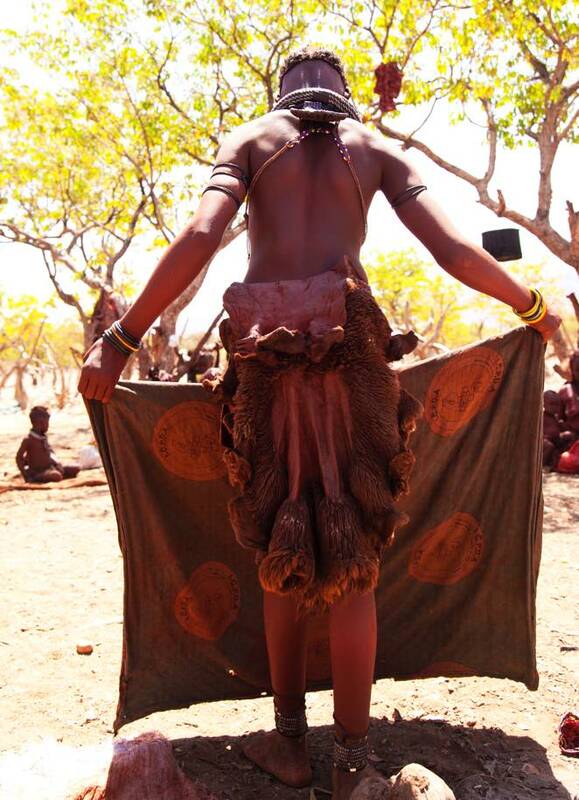 The beauty regime for the Himba women is cover themselves with a mixture of butter fat and ochre, called otijize. The ochre gives the skin a reddish color. Red signfying the color of the earth and color of blood, which symbolizes the essence of life. 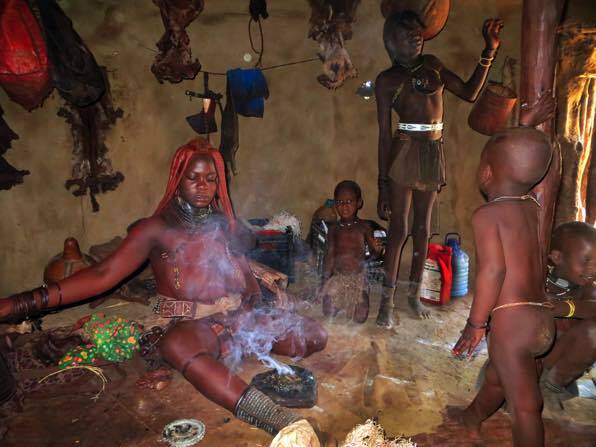 The Otijize is rubbed onto the skin and into the hair on a regular basis to cleanse, protect the skin from the sun and insects, and as a perfume.The aromatic resin of the Omuzumba bush or lavender is added as well. 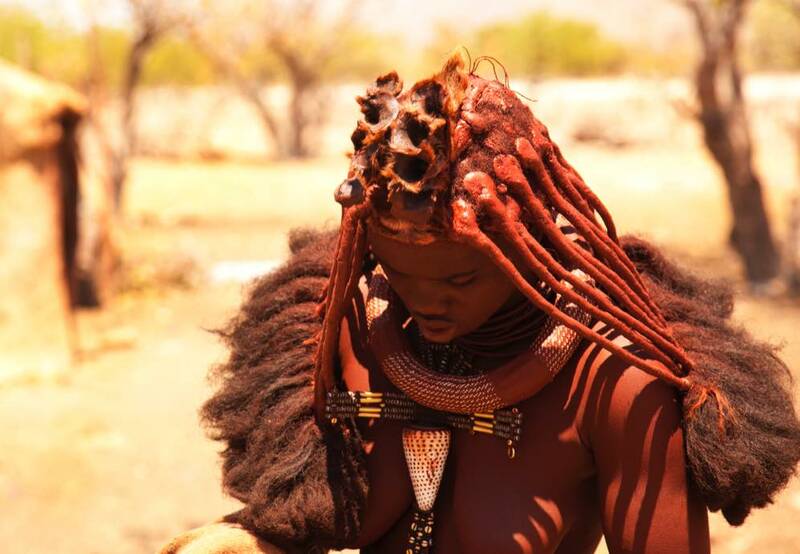 The Himba women seldom bathe, with water being so scarce in the desert.